Only with this update get a 100 bonus Zold that will get you started with a few puzzles to choose from! It's creative! Develop your logic skills! It's competitive! Do it quicker, faster and better! It's fun! Improve yourself by playing! Bear in mind that Brain Puzzle is a game of skill - you need to keep all of your wits about and muster all of your dexterity and cunning in order to get 3 Stars and bonus Zold! The entire game can be completed FREE OF CHARGE if you manage to get 3 Stars for each puzzle as you go through them! It's entirely up to you to complete the goal and progress further! We hope you enjoy playing Brain Puzzle! 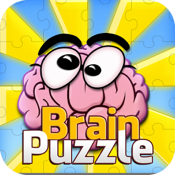 Brain Puzzle is completely free to play but it contains items which can be purchased for real money. If you do not wish to use this feature, please disable in-app purchases!